To define the concept of emergence as ‘a process whereby larger entities, patterns, and regularities arise through interactions among smaller or simpler entities that themselves do not exhibit such properties’ (1) helps us to better understand print as Marshall McLuhan saw it: a fundamentally emergent technology. The printing press was a convergence of several seemingly disparate technologies which came together to mechanise the act of writing. Written word had long since made language a visual medium, but McLuhan holds that medieval scribal culture was still a culture of oral text, due to its modes of transmission and the irreproducible nature of the scribal manuscript. Print removed the scribe from the creative and interpretive space he occupied between the created document and the document to be created, replacing him with the press’s technological reproduction. As such, the codex as a publication format took on new formal structures: text separated into blocks, standardised margins, headers, footers, and so forth. McLuhan is particularly concerned with the ways in which print’s emergence affected Western thought and culture. He links the spatial dimension that print gives language to the larger scheme of spatial perception in the Western world, especially the privilege given to single-point perspective and linearity, both of which have long-since embedded themselves in our understanding not only of pictorial space but of narrative and the act of reading. A document is to be read page by page, and each page of text is to be read left-to-right; things follow one another in this direction, and we tend towards the same habits when reading an image. Such is the conditioning of the Western reader’s gaze upon a surface populated by visual information. A concern in the art world with creating realistic representations of Euclidean space on two-dimensional surfaces led to the use of camera obscura, introducing projection to the artist’s process. Advances in chemistry eventually allowed for the preservation of those projections and the emergence of photography, from which the cinema later developed. Both comics and film, so often compared in critical literature despite being vastly different media, emerged in a period between the mid-1880s and the turn of the twentieth century during which the modern understanding of time was being globally restructured. This is owed largely to the field of physics establishing the Second Law of Thermodynamics (the law of entropy) in the mid-nineteenth century which, as Mary Ann Doane notes, ‘engendered a conceptualization of time as the tightness of a direction, an inexorable and irreversible linearity’ (3). An international conference in Washington DC in 1884 established the exact length of a day, set the zero meridian at Greenwich, and delineated twenty-four global time zones. This change in the worldwide conception of time is worth noting, though it would be an untenable position to claim that the cartoonists and filmmakers of the period were consciously influenced by these changes as they developed new ways of depicting narrative time. Comics (here I must borrow a brief explanation from Hillary Chute: ‘I refer to comics as a medium, and so when appropriate I give the term a singular verb’) differs from film in this context in that it was not a new technology but an emergent form within print. The printed image and the printed word had existed side-by-side for centuries, primarily as prose writing accompanied by pictorial illustration; however comic strips, which employed panels combining cooperative elements of image and text arranged in narrative sequence, were first published by newspapers in the 1890s. These strips, and the proliferation of books, albums, and magazines which would follow them, use static pictures positioned beside and around each other to imply the passage of time. Film also arranges still images in sequence, but creates the illusion of time and movement by tricking the audience’s eye into seeing movement by presenting the frames one at a time in rapid sequence. Film only functions in this illusory capacity if it continues its steady forward motion, or frame rate; it is very much a ‘second law’ medium, bound up in the forward flow of time. Comics is a spatial rather than temporal medium; all images on the page exist simultaneously in front of the reader, just as all pages exist simultaneously within the book in the reader’s hands. The progression of time in the image-text is achieved by means of the reader’s assumptions about how reading works; the Western gaze approaches the page from left-to-right (4), assuming a linear, causal nature in what it encounters there (the first visual utterance leads into the utterance to its right, which is next temporally and/or an effect of the first, and so on). In this way, comics produces narrative time by presenting a non-linear visual system from which the reader’s gaze constructs connections between ‘smaller or simpler entities that themselves do not exhibit such properties.’ Thus an understanding of time emerges from the visual-spatial ‘system of comics’. If the printed word spatialises and visually structures language or, more pointedly, speech – that is to say oral language which had no previous spatial dimension save the range of the speaker’s voice and the proximity of the audience – what, then, does comics spatialise? The answer to that, I believe, is obvious to the point of being boring and broad to the point of being exasperatingly generic: ‘narrative’. More specifically, oral narrative. 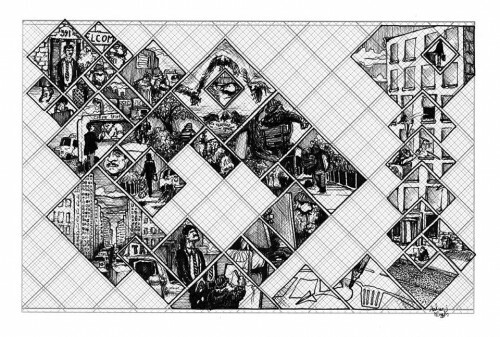 In The System of Comics, Thierry Groensteen defines in detail six functions of the comics panel which form a conception of how comics tell their stories. In Living Narrative, Elinor Ochs and Lisa Capps present a comprehensive study of day-to-day storytelling and personal narrative, and propose a ‘dimensional’ approach to understanding narrative. I want to use the ideas of Ochs and Capps to unpack Groensteen’s System, to relate visual panel function to the intricacies of oral telling and examine the ways in which comics spatialises both the phonetic and gestural aspects of narrative communication. I find it interesting that the sequentially read strip-and-page form is the default for comics, as they are not bound to linearity. Their stable, physical nature allows the reader to actively explore the image-text in any direction, granting comics a liberty to explore the non-linearity that temporally structured narrative media are denied. The viewer of a film or the audience member at a stand-up comedy performance, for example, is bound by time to the storyteller’s account, and it is therefore the job of the teller to deliver a clear and comprehensible account. In this respect comics can be seen as spatialising an existing system of delivery, rather than approaching narrative in a ‘born visual’ manner. My sketch of this idea is only brief and there is much more work to be done in this direction, beginning with the emergence of time within the spatial system of comics and working outwards to a broader understanding of comics as a form of visual telling. (1)	From ‘Dynamics, Complexity, Evolution, and Emergence – The Roles of Game Theory’, e-Study Guide for: The Microeconomics of Complex Economies: Evolutionary, Institutional, Neoclassical, and Complexity Perspectives by Wolfram Elsner, ISBN 9780124115859, Prepared by Cram 101 Textbook Reviews (Content Technologies Inc., 2015). (2)	McLuhan referencing Usher’s History of Mechanical Inventions; Marshall McLuhan, The Gutenberg Galaxy: The Making of Typographic Man (Toronto: University of Toronto Press, 2011), p. 173. (3)	Mary Ann Doane, The Emergence of Cinematic Time (Cambridge: Harvard University Press, 2002), pp. 4-5. (4)	Thierry Groensteen, The System of Comics, trans. Bart Beaty and Nick Nguyen (Jackson: University Press of Mississippi, 2007). Groensteen discusses the ‘structuring’ function of the comics panel in relation to the reader’s gaze on pages 46-48.